I never really loved Christmas the way I do now that I have my son. To me Christmas always was and still about Christ being born. But now that I have son, its so much fun picking out gifts for him and my in laws. This year the Christmas orders was kind of quiet and I liked it because we went to New Jersey to spend Christmas with the in laws. But before we left, I made some cupcakes for my church choir. We had a choir fellowship the Thursday before Christmas. I decided to make red velvet cupcakes (I think red velvet is Christmas-y since of course its red). I put fondant gingerbread men and candy cane pops as cupcake toppers. The second cake I did was for my mother in law. It was kind of an exchange of sorts. My husband is Haitian American and his mother is Haitian. She immigrated to the US before my husband was born, so she has been here for quiet a while and is now an American citizen :) but she only cooks traditional Haitian food which I can't cook. So any time we go visit my husband always request what he wants to eat while he is there.. well fast forward 4 years and I have developed a taste for Haitian food as well. So this year I made a request of my own through my sister in law. So in exchange for cooking my favorites, I made her a Christmas theme carrot cake. The carrot I made was the traditional carrot cake but without the raisins in it and I switched the filling. So instead of a regular cream cheese icing, I made a mascapone cheese buttercream. I haven't worked with that kind of cheese before so I was a bit worried as to how she would like it, but apparently I had nothing to worry about because she and everyone else LOVED it! I was soo pleased. The last cake I made was for a Christmas birthday. I hope you guys follow me on this one but my god daughter's older sister's son (my god daughter's nephew) was born on Christmas. He turned 5 and loves the Cars movies. So his grandmother ordered a small Cars themed cake for his birthday with a Lightning McQueen figure on top. I was pleased with how the cake topper came out since I haven't done a car of type before. I know what I would do differently now, but for my first try he was pretty cute. The cake was vanilla with a chocolate pudding filling (since the birthday boy doesn't like fillings). This past weekend I had a very busy weekend for me in that I had a cake due on Saturday and then a big cake order due on Sunday. Next post I will talk about the cake on Saturday, but this post about the Candyland theme cake I made for Sunday afternoon. The cakes itself was not the problem, but rather the amount of detail that was on the cakes that was the problem. I can easily say this is the most detailed cake I have done in a long time. 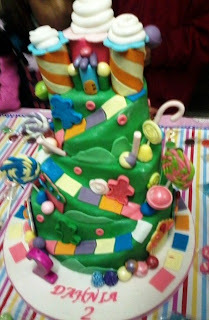 I had to make each of the lollipops, gumdrops, peppermint sticks, candy canes, suckers, etc on this cake by hand. So I started making them the night before and woke up early Sunday morning to continue making all of the items for the cake. I worked on these cakes up until 3pm and the delivery was scheduled for 4:30pm in Lancaster, PA. And on top of that I had to take a quick shower and get dress. So I was definitely running around the house like a mad woman. I have LEARNED my lesson! Start design details early on very detailed cakes. 3 tier cake- top tier is strawberry, middle is vanilla and bottom is red velvet. Customer took picture and sent it to me. For some reason I forgot to take a picture. Thank goodness my client took one. Table set-up. A cake on the left is a 10 inch chocolate cake with stripes in coordinating colors and more lollipops shooting out the top. The cake on the right is vanilla covered in pink and decorated with fondant cupcakes. The place was decorated sooo cute! It had balloons that looked like lollipops and colored paper on the floor to look like the colored blocks like the game. They even had cotton hanging from the ceiling to look like clouds. Definitely one of the cutest birthday set ups I have delivered to so far. Since the first half of this week has been a little quiet, I decided to take this time to blog a little before I get busy tomorrow. And with a very active 2 year old that gives me little time to blog early, but today for some reason he seems to want to cooperate with Mommy so I capitalized on the opportunity and am blogging :) I have to admit I am slightly obsessed with cake pops. I think they are so cute and you can mold them into different shapes to match an event or party. So when I came up with the idea of running a cupcake special for the next two weeks, I decided to give away 1/2 dozen cake pops with each order...how great is that!!! Not only do customers who haven't had cake pops before get to try them, it also allows me to come up with new designs and ideas for them. So I thought it would only be fitting for me to dedicate this post to the cake pop. Below are just a few cake pops I have done over the last couple of weeks. I hope you enjoy looking at them as much as I enjoyed making them. Purple & Blue Swirl Cake Pops- Dipped in chocolate and swirls piped in white chocolate and then sprinkled with clear sanding sugar. 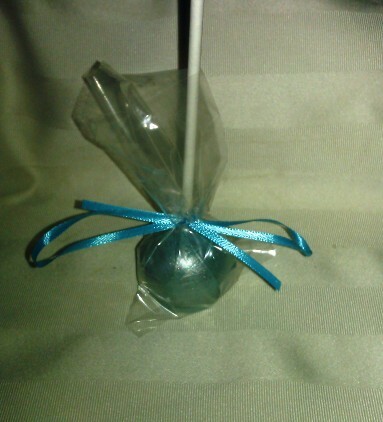 Blue Silver Cake Pop- Blue cake pop and hand painted with silver edible dust. Apart of the Light Blue Glitz Collection. 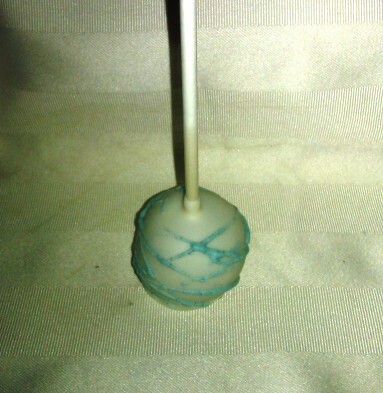 Blue Stripe Cake Pop- Apart of the Light Blue Glitz Collection. The Light Blue Glitz Cake Pop Collection- now for sale on my Etsy shop.